Drag and Drop the PolySmoother.mzp installer onto your 3ds Max viewport or run it via Menu|MAXScript|Run Script... and click Install. You can assign a "Hotkey" or a Menu Item to open PolySmoother. 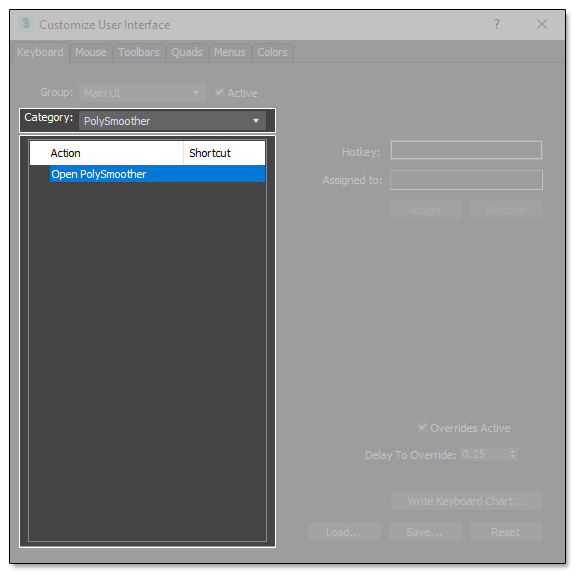 To access it go to Customize->Customize User Interface... in 3ds Max menu bar, and under "Category" select PolySmoother as shown in the image bellow. To uninstall PolySmoother, simply Drag and Drop the PolySmoother.mzp installer onto your 3ds Max viewport or run it via Menu|MAXScript|Run Script... and click Uninstall.